My September Sephora Play box just arrived and this is my favorite one to date! 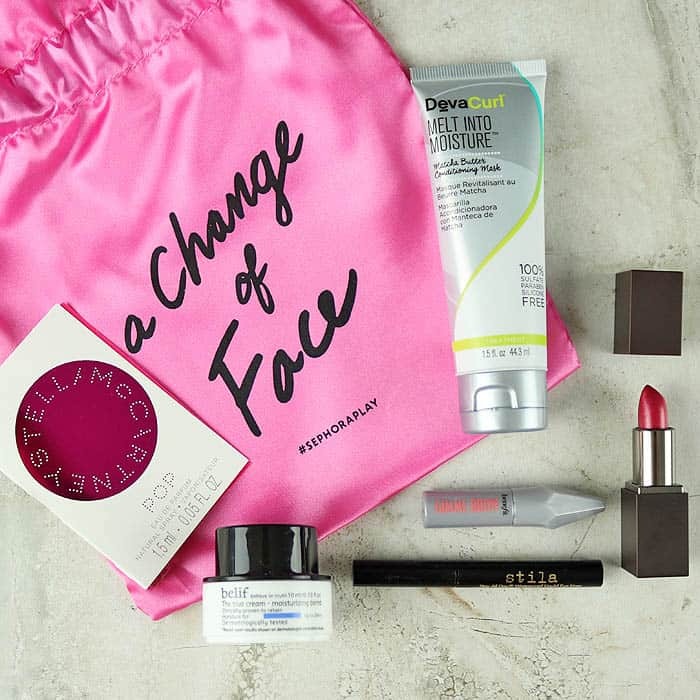 If you’re unfamiliar with Sephora Play, it’s a monthly subscription box filled with samples. For $10, you receive 5 deluxe samples plus a fragrance sample every month packaged in a cute fabric bag. I’ve tried this fiber gel in the lighter color before and I wasn’t a fan. Turns out, I’m not a fan of this darker color either. The lighter color barely showed up on my brows and the darker color was way too dark. 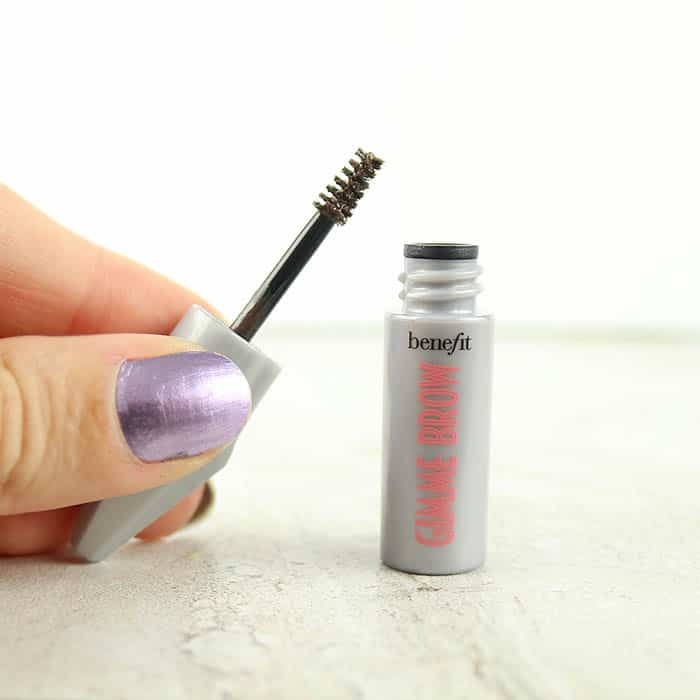 I lightly brushed it on my brows and it make them look heavy and painted on! This could be a good product for dark hair but it definitely isn’t made for redheads. 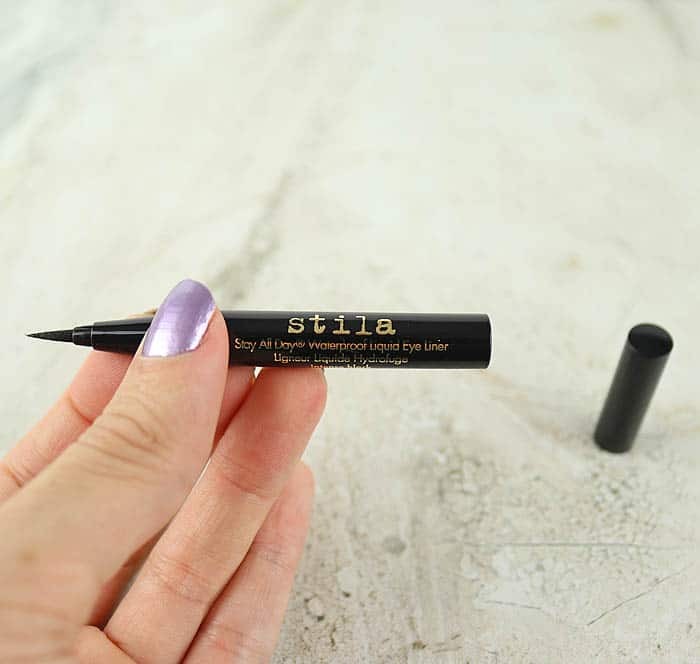 as the best liquid eyeliner I’ve ever tried. Well, this Stila one has it beat! The tip is super fine and it gives you a perfect razor-thin line. It’s very easy to draw a straight line. The formula is jet black and it has great staying power. I’ve already purchased the full size- this one is a winner! I love hair masks and this one is fantastic! The tube recommends that you can leave it on for 3 minutes, 15 minutes or overnight (pass…sounds way too messy). I applied it and left it on for 15 minutes with a shower cap. When I washed it out my hair felt like silk! It was soft, frizz-free and easy to style. It contains matcha green tea butter, almond oil and beet root extract. Anyone with thick, curly or wavy hair would benefit from this. 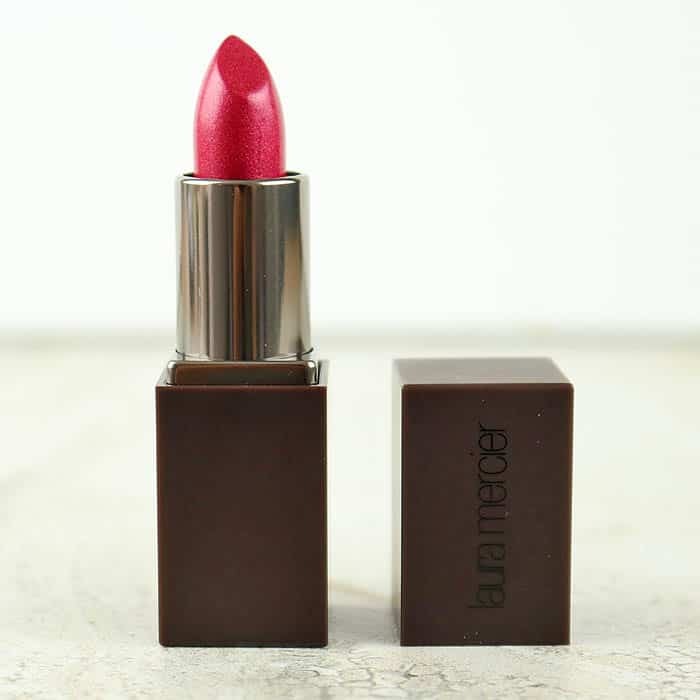 I’ve always been pleased with the quality of Laura Mercier’s makeup and this lipstick is no exception! The color “Happy” is a warm fuchsia that really wearable. Being a redhead, fuchsia lipstick can be tricky. This shade is very flattering and it doesn’t go on too dark. The formula is creamy, long lasting and it doesn’t dry out your lips thanks to the addition of mango butter. This is my new go-to lipstick for the daytime. I’m curious to try some of the other shades since “Happy” is so flattering. 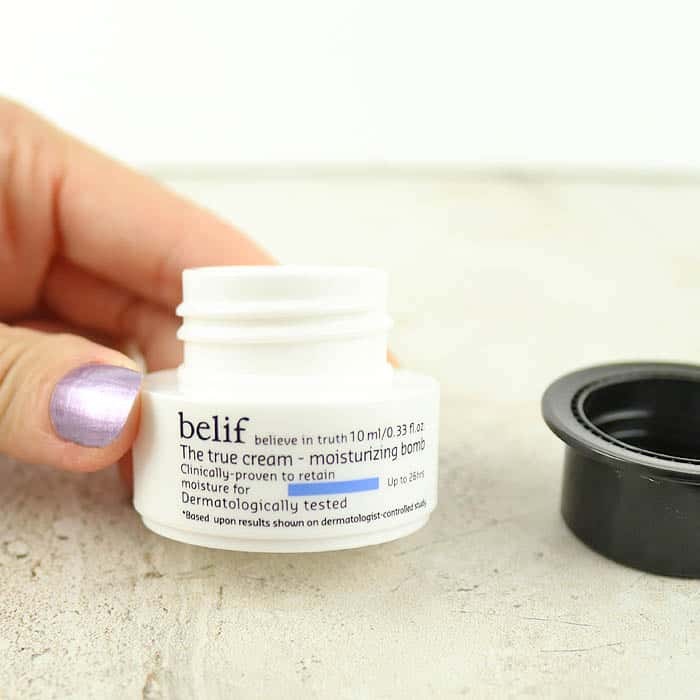 I’ve been hearing a lot about the Korean brand, Belif, lately so I was psyched to find this moisturizer in the box! My skin gets so dry in the fall and winter so I need a rich moisturizer. This one felt wonderful on the skin and it has a clean fresh scent. This will probably be too rich for oily skin (maybe for normal skin too?) but it’s perfect for dry skin. A pleasant surprise? The price- I expected the full size to be around $60 and I was shocked to see it was less than half of that! 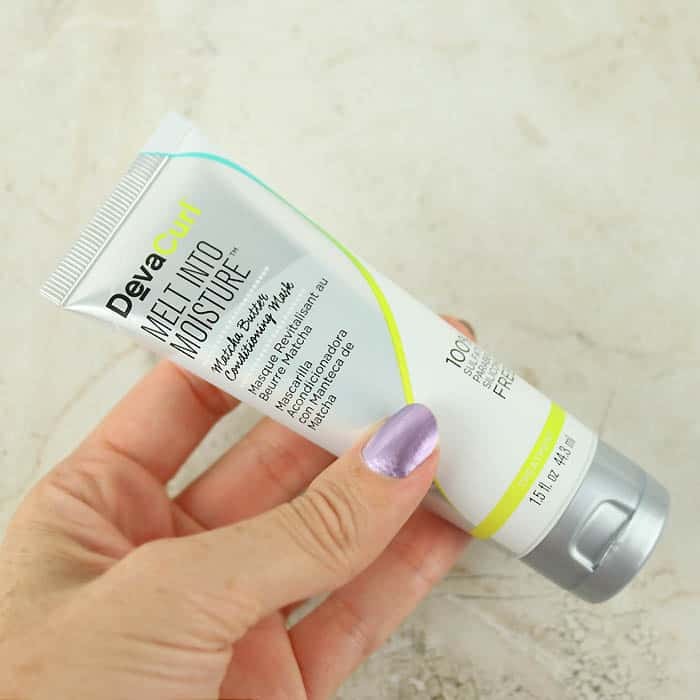 The is a great moisturizer for the price. 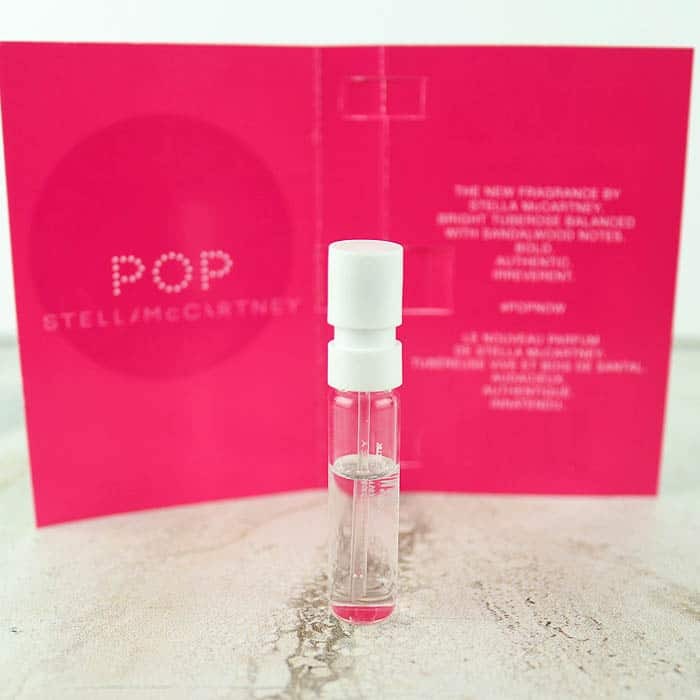 Pop is described as being a floral, woody fragrance. It smells very sweet and summery so I was surprised to find it in the September Play box. It has notes of Tomato Leaves (which I was weird to see in a perfume because tomato plants don’t smell all that great! ), Violet and Sandalwood. I’m normally not a fan of sweet, floral scents but this was nice. It smells very sugary when you first spray it but then it dissipates. I would buy the full size of this for the Spring/Summer.